Offers hand-shaped sourdough breads & pastries, from organic grains. Includes bread and pastry selection, with hours & availability. Dan Riesenberger has been baking professionally since 2007. From discovering the benefits of sourdough breads to building and operating a stone hearth, he has had a strong passion for producing wholesome breads for his community. The majority of Dan’s professional life has been spent in kitchens. He got his start at the Northstar Café as their full-time baker. While working there Dan was gifted a sourdough culture that a coworker had procured from her time at the Cordon Bleu Institute. This sourdough starter has been in constant use ever since. Daniel tending the 1500 degree hearth, circa 2009. 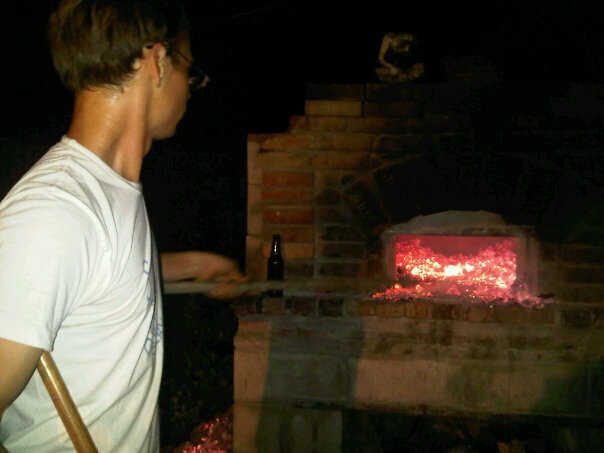 In 2008, Dan and his father built a wood-fired brick oven right in Dan's backyard. This oven required twelve hours of constant firing in order to store enough heat for bread-baking. Using this old-world process of baking from retained heat, Dan cultivated an intuition of timing, which informed the techniques that we still use today in our much more modern kitchen. As the business grows, Dan is constantly involved in production from shaping and mixing to hand-laminating croissants and baking beautiful loaves. In his free time, Dan is often found drinking insane amounts of espresso and biking long distances throughout central and southern Ohio. He lives in Clintonville with his cats.